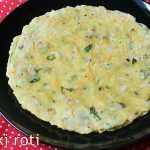 Akki roti recipe – akki meaning rice in kannada, rotti refers to a flat bread cooked on a griddle. So akki roti refers to flat breads made with rice flour. 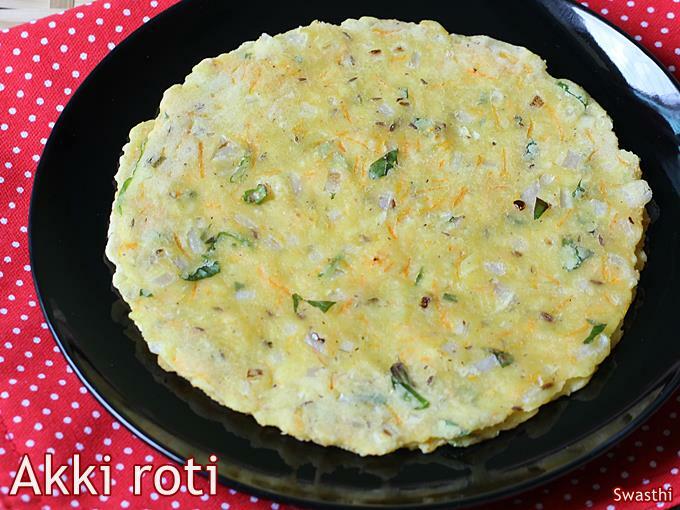 Akki roti or rice flour rotti is an everyday food from karnataka cuisine. They are served with a chutney either for breakfast or lunch. Even beginners can make these and it just takes 15 minutes. There are few different versions of these akki roti based on the regions of karnataka. I am sharing a simple akki roti recipe here. 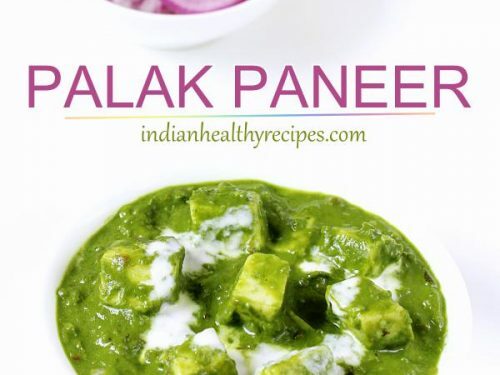 It can be made on the pan directly or on a cotton cloth, foil or banana leaf and then cooked on tawa/ pan. Since i made this only for 2 of us – myself and my little son, I made it directly on the tawa. If making for the entire family then it is a tedious task to make directly on the pan. So when i make for the entire family I make akki roti on a greased foil, which works wonderfully good. Traditionally it was made on a white cotton cloth or on a banana leaf. Back home in India we use banana leaf as we have the banana plants in the backyard. If you are accessible to banana leaf you can use it. However banana leaf does not lend any flavor to the akki roti. It is just that you can use it & discard. It is also healthier than using a aluminum foil or parchment paper. 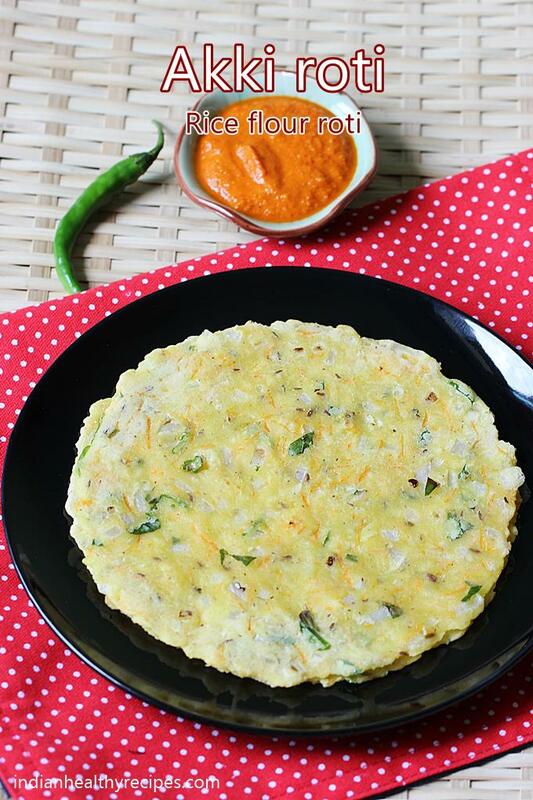 Rice roti can be made thin or thick to suit your taste. Getting them thin and uniform comes just out of practice. This recipe will help you to make soft akki roti. Traditionally to make akki roti, ingredients like Chana dal, fresh coconut, chopped onions, coriander leaves, green chilli, jeera and rice flour were used. 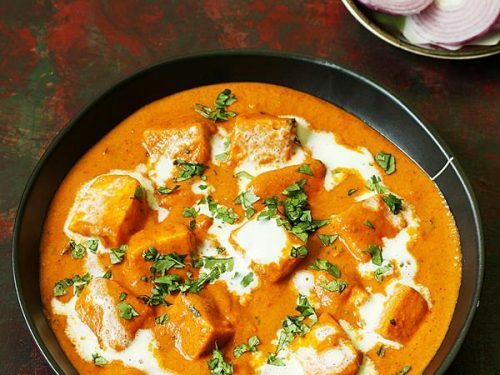 However veggies like grated carrot, cucumber, bottle gourd, capsicum, sabasige soppu (dill leaves) are also used in some regions or to suit ones liking. 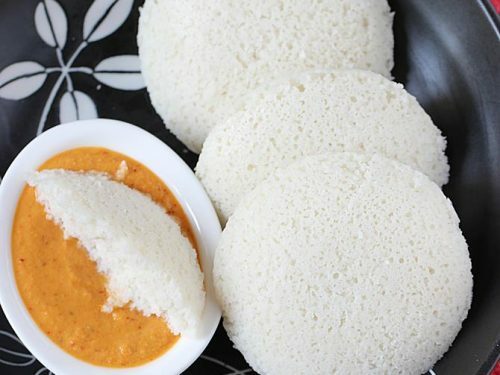 In some parts of karnataka these are made only with rice flour, coconut, green chili and cumin. 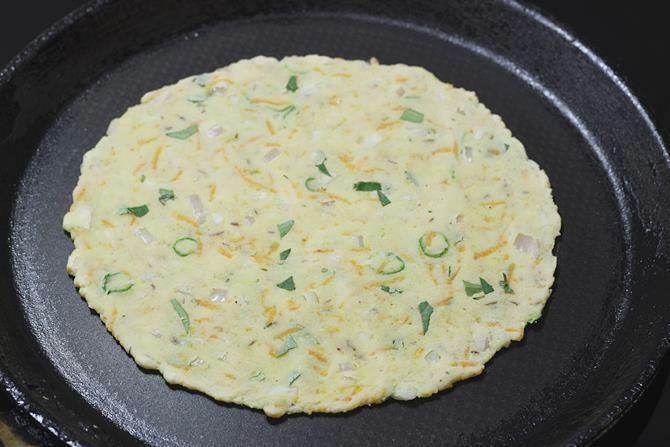 Always use fine smooth rice flour to make the rotti. If your flour is not fine then the akki roti will turn tough & hard. So if you feel the flour is not fine & smooth, then you can also sieve it. It is the quality of flour that makes a lot of difference. 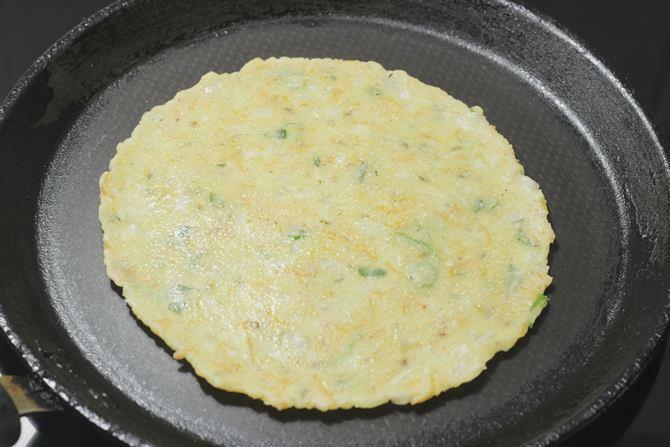 Making use of good rice flour will prevent the akki roti from breaking. It also helps to make very thin rotti like mine. The dough must be moist and sticky. This helps the akki roti to spread well while making. Dip your hands in water to moisten the dough to get soft rotis. If using banana leaf make sure your rinse it well to remove the dirt and use. I use store bought rice flour to make akki roti. But traditional homes, wash the rice, then dry them in sun. Lastly mill the grains in flour mill. The taste of the akki roti made with such flour is much superior to the store bought one. The rotis turn out soft and not tough. 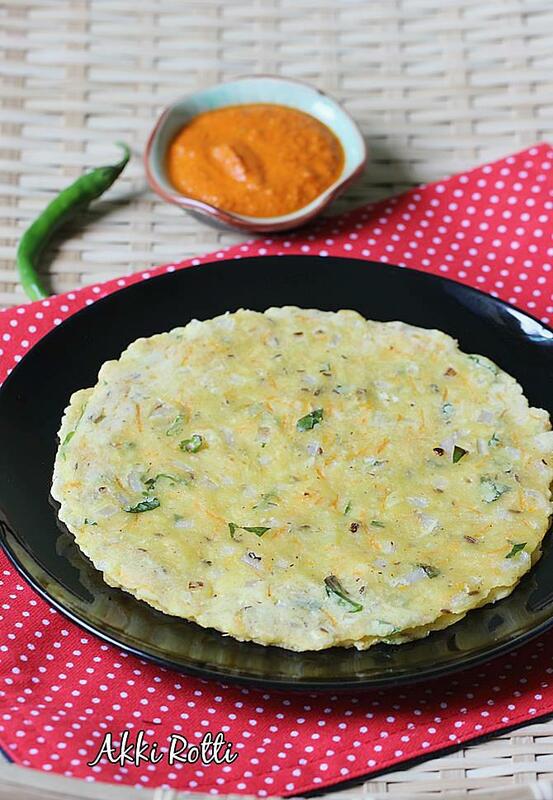 Karnataka akki roti are simple flat breads made with rice flour, mix vegetables and cumin. Akki translates to rice and roti to flat bread in Kannada. These rice flour flat breads are eaten for breakfast or a meal with chutney. Wash and chop very finely – onions, chilies and coriander leaves. Grate the carrots & ginger. If using sabsige, rinse well and chop finely. 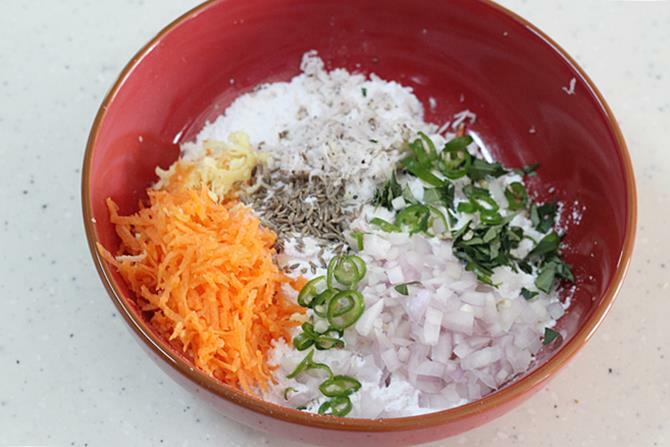 Add 1 cup flour to a large bowl along with salt, cumin, chopped onions, chilies, coriander leaves and carrots. Mix everything well. If using coconut & dill leaves add them too. Pour water little by little and make a soft dough. The dough must be smooth and moist. Divide the dough to 4 equal balls. Roll to smooth. Keep the bowl covered to prevent drying up. You can make akki roti on a greased banana leaf, moist handkerchief, foil or parchment paper. Place a ball on the moist cloth or foil or greased banana leaf. Begin to spread it lightly with your fingers to make a round roti. If the edges of akki roti crack, then dip your fingers in water and join the cracks. Then continue to spread it. 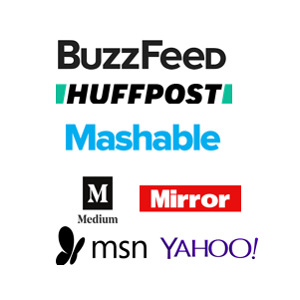 It can be made thick or thin to suit your taste. If making thick, make 3 finger sized wholes with one and half inches apart. Heat the greased tawa on a medium high flame. Lift the banana leaf or parchment paper and reverse it on the hot tawa. Gently peel off the leaf. When the base firms up & golden, flip it. Toast it on both the sides. After flipping it sprinkle some oil to prevent dryness. Press down with a spatula to cook evenly. When brown spots appear, akki roti is done. Do not over cook it may turn hard. While you toast the akki roti, make another one on the leaf or cloth. Transfer to the tawa after the first one is done. 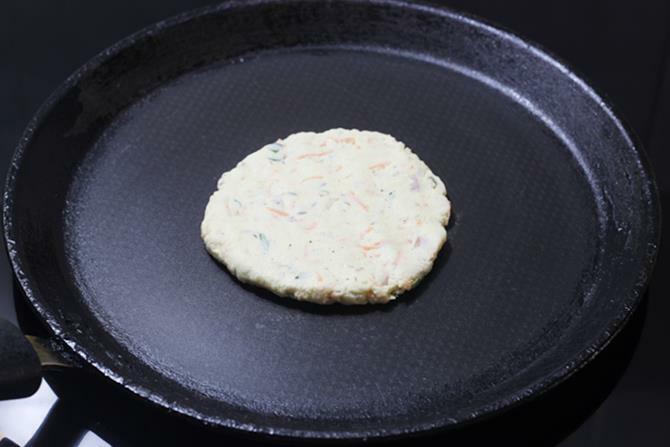 If you are making directly on the tawa then you will need 2 tawas to use them alternately. Or cool the tawa completely and then spread the next roti. Lightly grease a cool tawa & keep it on a kitchen counter. Place the ball on the tawa and spread it directly to a thin akki roti. Place the tawa now on the stove and cook until the base firms. Then flip & cook on the other side until done. Press down with a spatula to cook evenly. To make the next akki roti either use another cool tawa or wait until the first one cools completely. If you try to spread the dough on the hot tawa it will get stuck and not spread at all. Dil leaves or sabasige soppu have a very strong aroma. So use in moderation as the flavor may not go well with everyone. 1. 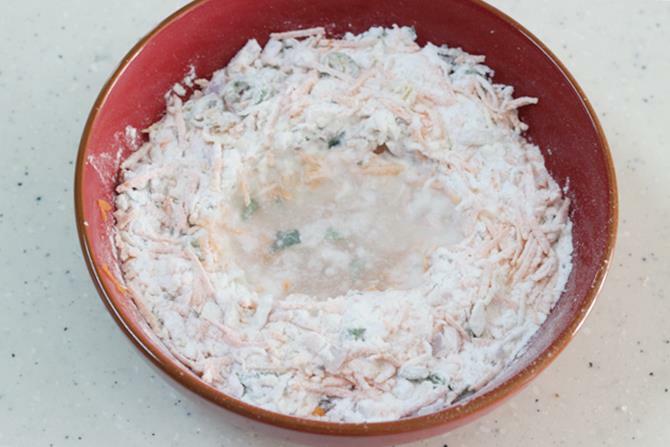 Add rice flour, salt, coconut, cumin, green chili, coriander leaves, finely chopped onions to a large mixing bowl. If you prefer thin rotti, then make sure to chop onions finely. Grated carrot, cucumber, bottle gourd, ginger and curry leaves can also be added. If using chana dal soak them for about 30 to 45 minutes in hot water and use. 2. Mix up all the ingredients well. 3. Add water little by little to bind the flour. Avoid pouring lot of water at one time. Keep adding more water as you need. 4. 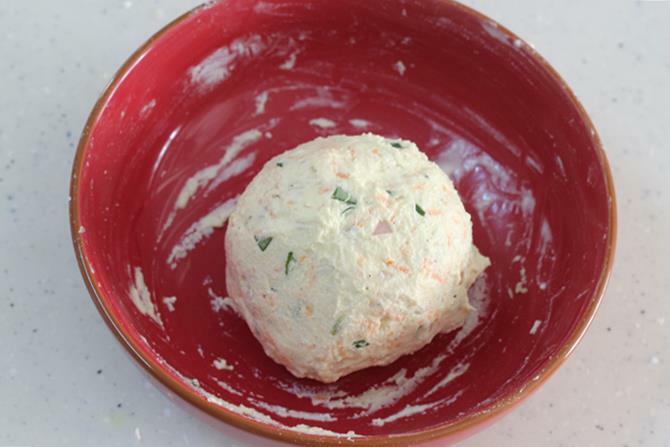 Make a moist ball of dough out of the flour. The color of the dough changed due to the carrots. The akki roti dough has to be sticky & moist as it helps to spread the dough easily. 5. 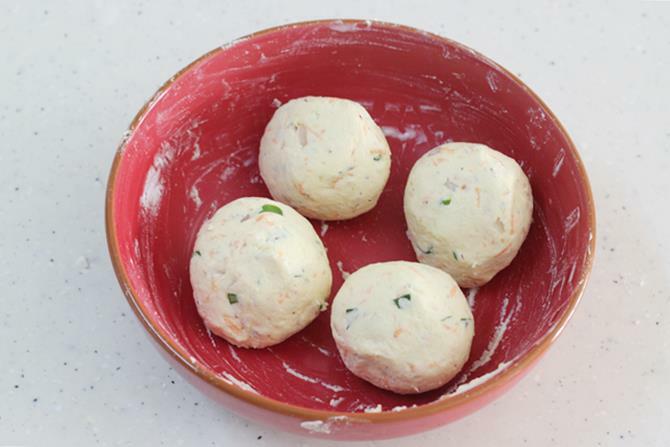 Divide the dough to 4 equal balls. If making in large quantity, then you can rinse 2 white cotton cloths or use foil or banana leaf to spread the akki roti. Squeeze up the cloth, it must be just moist with no dripping water. Spread the cloth and place a ball over it. Gently spread the dough with your fingers. 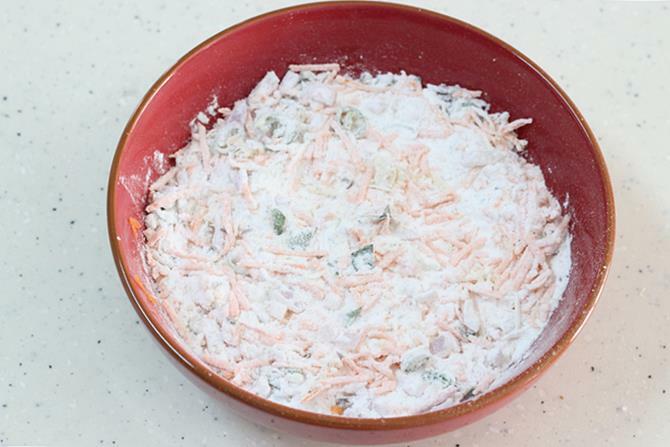 If the dough doesn’t spread well, then keep dipping your fingers in water and continue to spread. Heat a pan, just lift the roti with the cloth gently and place the roti on the tawa(roti side onto the tawa). Gently dab on the the pan. Slowly remove/lift up the cloth. Cook it on both the sides as shown below. Since I made just 4 rotis, I used 2 pans and made the akki roti directly on the cool tawa. Note the tawa has to be cool before you spread the roti otherwise the dough will get stuck on the pan. 6. Grease a cool pan & place it on the kitchen counter. Do not heat the pan now. Place a dough ball on the tawa, begin to flatten it evenly. 7. If there is enough moisture in the dough, it spreads easily and evenly. Keep a bowl half filled with water aside. If needed dip your fingers in the water and spread the dough. This also helps to keep the rotti soft. If making thick roti, make few wholes on the rotti every 2 inches apart for even cooking. Once you are done making the akki roti, keep the tawa on the stove and cook it. 8. When you see the rotti is cooked on one side to light golden, flip it and cook on the other side as well until light brown spots appear. Add oil on the inner side and cook once more. Press with a spatula for uniform cooking. 9. To make the next roti, either we have to cool this pan completely and then use. Or make use of 2 pans, use alternately until the other one cools. Serve akki rotti with chutney. These are good to serve hot. As they cool down they may turn hard & dry depending on the kind of flour used. If you plan to make these akki roti a few hours ahead then stack them and keep them covered in a clean cloth. I followed your recipe to dot.. 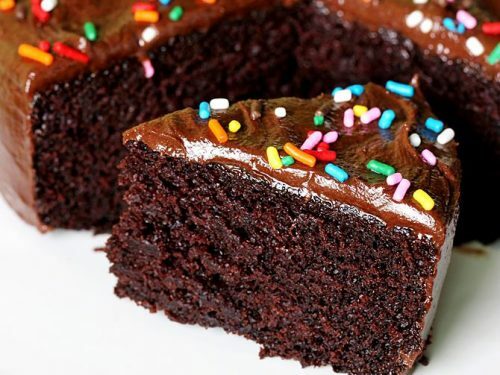 They were very yummy.. We loved them.. All your suggestions are very helpful..Especially the one where you mention that we need to wait for the pan to cool completely if using a non stick.. Thank you so much for trying. Glad to know the recipe was useful. Thank you. Yes do try them. I made the akki roti with your tomato chutney. we all loved very much. Today I followed your recipe and prepared Akki roti. It was very tasty and everyone enjoyed it. Thanks a lot. Thanks for trying. Glad all of you liked it. I made akki roti with your coconut chutney. thank you so much. Amazsing recipes. Will try the akki Roti first.. Thanks a lot. Yes do try it. Super Akki roti!! Made them today for breakfast. Came out delicious 😋! Thank you for sharing! 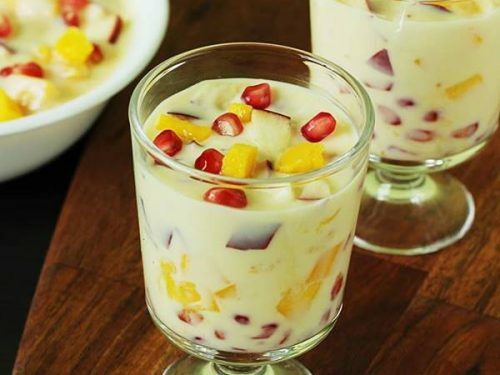 Thanks for this quick ealthy recipe. welcome and thanks Rashmi. Glad to know you. Have a nice week ahead. What is the combo for the akki roti? ?Please give that too.. I have mentioned in the beginning of the post, it is served with a chutney. 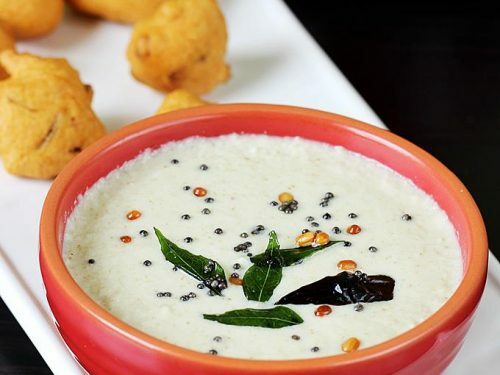 You can try this coconut chutney , you can also skip coriander in the chutney recipe and replace chana dal with fried gram.